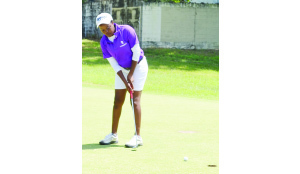 •GOING FOR A BIRDIE……LOCAL player, Lorna Mwenda putts on the ninth green during the second round of the Zambia Professional Ladies Open Golf Championship in Ndola yesterday. Picture by FELIX MALUNGA. EUROPEAN Ladies Tour top campaigner, Stacy Bregman yesterday took a two-stroke lead into the final round of the inaugural Zambia Ladies Open Golf Championship in Ndola. As the foreign professionals were blazing on the 5,955-metre course, Zambia’s prospects in the competition, which ends today, diminished badly with top-ranked amateur, Melissa Nawa tying for 30 with South African, Nicole Becker on 17-over-par 163. Bregman, who is seeking her first title since 2008, shot a 69 for a six-under-par 140 second day total, two shots ahead of Swaziland’s Nobuhle Dlamini, who also seemed determined to spoil the broth for the South African. The 27-year-old was a further five shots ahead of round one leader and compatriot, Kim Williams. After frittering away the second hole which she bogeyed, Bregman finished strongly on the front nine by birding the eighth to even the course. Bregman, who is hoping her first visit to Zambia will end in victory, kept her game together on the back nine where she birdied the 10th, 14th, 15th and 18th to record the day’s second best score of 69, one adrift Saturday leader Dlamini. “Personally, I’d love to win here at Ndola, though. 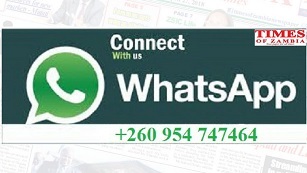 It would be something to be the first name on the Zambia Ladies Open trophy,” the South African, who is the top-ranked player in the field, said prior to the start of the event. Dlamini, who earned her European Tour card in December last year, promised a good fight today. “I am going to give everything to try and win, because I should have done better; I should have won already. I have received incredible support here in Zambia, especially from the youngsters. I looked up to black players as a youngster and I aspired to be like them. It would be great to become a role model for the next generation. They need to know that they can reach their goals, too,” Dlamini said. But Williams, who had set pace on the opening day with a slender lead, saw her game crumbling yesterday as she surrendered her advantage after dropping points to close day two on one-under-par 145. As for Zambian ladies, Nawa was the best-placed despite slipping to 30th after a second round 84. Her younger sister, Tina was a further six strokes behind to close the day on 35th after shooting 23-over-par 169. Kaela Mulenga was 40th on 26-over-par 172 with Miliase Siame and Tara Allin trailing their Zambian compatriot by 14 strokes while Lorna Mwenda had another bad day in office, managing 42-over-par 188, just a shot better than tail-ender, Shamiso Makwara of Zimbabwe. Meanwhile, Vehicle Centre Zambia has staked a Ford Eco Sport Titanium car worth K250,000 for any professional golfer who will sink a hole-in-one on the 17th.